I spend a lot of time looking at and for strange things, but sometimes I am surprised. You can buy Salvador Dali perfume. Sadly, there is no description of its smell, but I’m hoping for a swan-elephant juxtaposition. Elegant and strong. I’d love to know if anyone has actually tried the stuff. Super-famous creator of dreamlike and unique images Salvador Dalí would have celebrated his 112th birthday today, in his own fantasy world. Let’s celebrate by having a brief look at the man and his work. 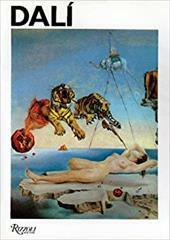 I must admit that my interest in Dali has waned as I’ve got older and I tend to roll my eyes when, 99% of the time, he’s the first Surrealist anyone can think of. But his work is wonderful and is always worth looking at. I also found this excellent Dali-inspired ring on Etsy. The artist will customise it to your own eye, or that of a loved one.